The WeatherFlow WEATHER Meter is the first WIRELESS Bluetooth® Smart portable and mountable weather station under $100 that syncs up to Smart phones and devices so you can record, share, and save all the weather data you could need. 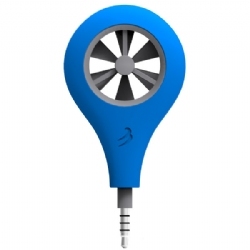 Works with iPhone, iPad, iPod, and all major Android devices. Affordable technology unlike any other. 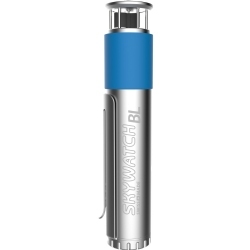 The JDC Skywatch BL300 weather station for smartphone featuring Bluetooth technology measures windspeed, temperature, and humidity. The JDC Skywatch BL400 weather station for smartphone featuring Bluetooth technology measures windspeed, temperature, humidity, and pressure. The JDC Skywatch BL500 weather station for smartphone featuring Bluetooth technology measures windspeed, temperature, humidity, pressure, and UV index. 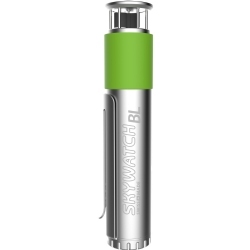 The Skywatch Windoo Windmeter is the first App-compatible plug-in unit by outstanding Swiss makers JDC Electronics, known for their precision and innovation. 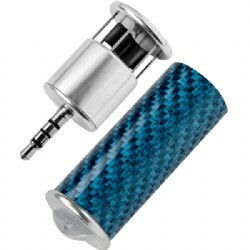 Small sleek design and Omni-directional impeller comes with Carbon case and strap and Works with newer iPhone, iPad, iPod, and Android devices. 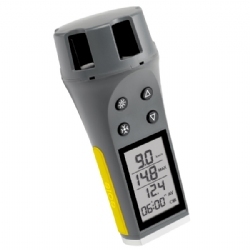 Windoo 3 for Wind, Temperature, Wind Chill, Humidity, Dew Point, and Pressure. Now COMPATIBLE with iPhone 6. 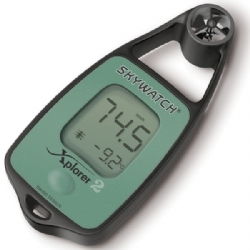 The Skywatch Xplorer 2 windmeter is a extremely accurate way to measure the wind, maximum windspeed, temperature, and windchill factor. Small and compact, the Xplorer 2 is one of the easiest ways to know what the wind is doing, and how much rubber you should put on before hitting the water. 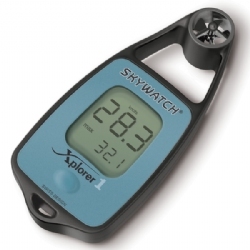 The Skywatch Xplorer 3 windmeter is a extremely accurate way to measure the wind and know exactly what size kite to rig up. 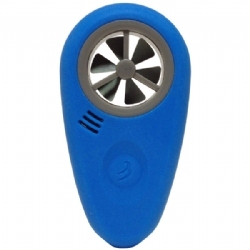 Small and compact, the Xplorer 3 is one of the easiest ways to know what the wind is doing before you hit the water. 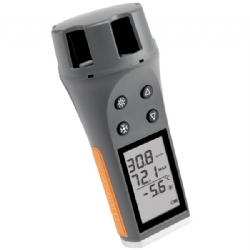 The Xplorer 3 features a windspeed indicator, temperature, windchill factor, and a digital compass. 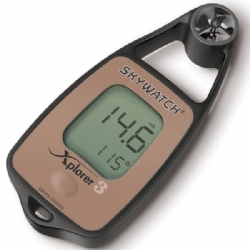 The Skywatch Xplorer 4 windmeter is a extremely accurate way to measure the wind and know exactly what size kite to rig up. Small and compact, the Xplorer 4 is one of the easiest ways to know what the wind is doing before you hit the water. The Xplorer 4 features a windspeed indicator, temperature, windchill factor, digital compass, altitude, barometric air pressure, 48-hour history of pressure, and 48-hr history of altitude. 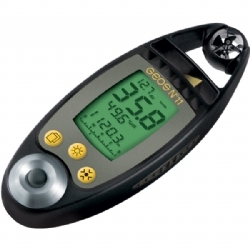 For many years, the Hall Windmeter has been a popular airspeed indicator for hang gliders, paragliders, ultralights, kiteboarding and other wind sports. It never needs batteries so it can be used anytime. There's a small port near the bottom you point directly into the wind and the speed is indicated by the red disc's height inside the windmeter. 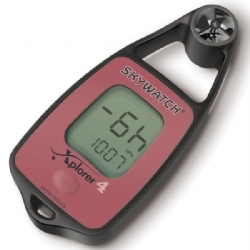 The Skywatch Eole by JDC offers you a hand-held Anemometer with deluxe features. 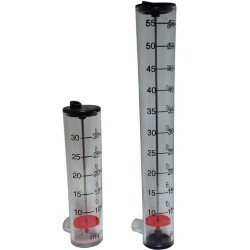 The large, easy-to-read display shows instant windspeed, maximum windspeed, and average windspeed all at once, while the 54mm impeller on the Eole provides very accurate readings without worrying about the position of the instrument. 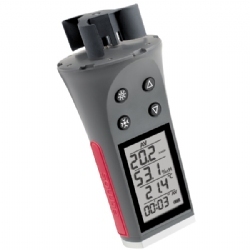 The Skywatch Meteos by JDC offers you a hand-held Anemometer/Thermometer with deluxe features. The large, easy-to-read display shows instant windspeed, maximum windspeed, average windspeed, instant temperature, maximum temperature, average temperature, minimum temperature, and wind chill factor all at once, while the 54mm impeller on the Meteos provides very accurate readings without worrying about the position of the instrument. The Skywatch Geos No11 is a high performance professional instrument, using only top industry quality components for pressure, windspeed, humidity and temperature sensors that are made in Switzerland. 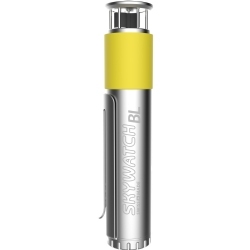 The Skywatch Geos is specifically designed for intensive use in harsh environments.